A grid magnet is a rather easy way to get unwanted iron particles out of product streams. They are commonly used in industries where product is flowing through silos, elevators, funnels or is otherwise transported by pipe systems. The transported product is typically dry and easy flowing. Our range of grid magnets now features a new round version which is easy to install by means of the Jacob flange on both ends of the grid. This makes it ideal for placement in pipelines or as a last safety check in big-bag filling machines for certain powders or plastic granulate. The Easy Clean principle makes these systems easy to use; by pulling the magnetic filter bars out of the housing the contamination is separated. 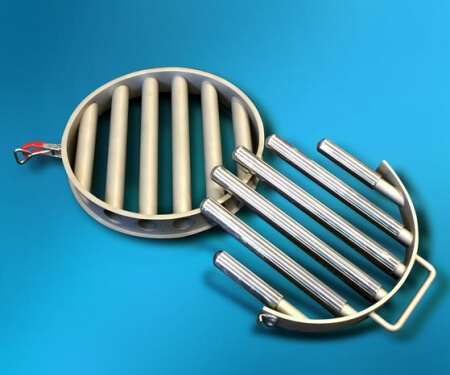 The magnets used in these filter bars are extremely powerful and can withstand temperatures up to 150C.